Security Pro USA: Kubatons easy self defense , hit and escape ! 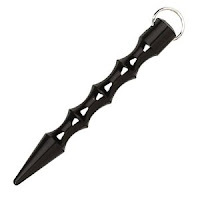 Kubatons make great key-chains and help you to feel more safe and secure! Features a black finish, one-piece finger groove metal construction with split ring. These are extremely easy to use and are a non-lethal means of defending yourself. The pointed Kubotan was designed to be used against bony surfaces, soft tissue and nerve points. It's effective because of the temporary paralysis & extreme pain it causes. The Kubotan increases the power of any strike. It is not necessary to waste time or miss an opportunity trying to be precise. A sharp blow to any bony part of the body will encourage your assailant to stop an attack.